Why are Rembrandt’s colours so different from the colours that we see around us today? Maarten Kolk and Guus Kusters explored it at the request of among others Museum De Lakenhal and The Rembrandt House Museum. There was something that Rembrandt was doing differently. Rembrandt’s colours have a lively depth to them, because he applied multiple colour layers on top of each other. The colours that you eventually see in his paintings are partially defined by the colour layers underneath. So different from most of the colours that we see in the world around us. Due to industrialization, all red coffee cups are plain and on top of that they all have the same uniform red colour. Studio Maarten Kolk & Guus Kusters researched what we can learn from Rembrandt. 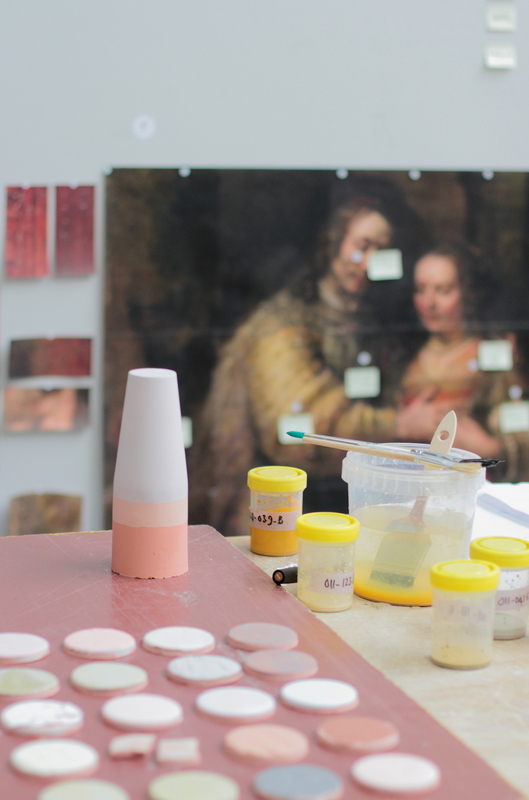 What happens if you apply Rembrandt’s idea of colour building to ceramics? Even though it is uncommon practice to use multiple layers of colour on top of each other in ceramics, this is what Kolk & Kusters did. For four months, resources, colour building techniques and recipes where studied closely, broken down and build up again using alternative materials, techniques and bases, at the European Ceramic Work Centre. With innovative results: turrets with a height of 20 cm that reveal all Rembrandt’s different colour layers. Once, the Langebrug 89 in Leiden was the place where a starting artist named Rembrandt Harmenszoon van Rijn received his first painting lessons. Now, a little over four hundred years later, this is the Rembrandt Class Room where the beautiful result of Kolk & Kusters for the Rembrandt LAB can be seen. The presentation has the air of a design exhibition: brightly coloured discs lie on the table and four small ladders in light wood and dark metal show coloured turrets. There’s something clinical about it, especially in comparison with Rembrandt’s warm, dark paintings of which copies are on the wall. It’s obvious upon arrival that it is about colour here. The main purpose of this project is to show how Rembrandt’s use of colour and material can enhance the current production industry and product design. To that end, Kolk & Kusters didn’t develop utensils as the final result, but recipes, colour combinations and suggestions for application. It’s probably not directly interesting for the industry, because the deep, layered colours require a lot of work, but the research shows how deep, lively and exciting colours can be.